1.Immediately separate cold eggs after taken them out from the refrigerator (cold eggs separate more easily) into two mixing bowls (No oil and no water in these bowls, clean and dry bowls). Set aside and allow them return to room temperature. 2.Add in sugar into egg yolks, immediately lightly whisk the egg yolks and sugar till light (Try to whisk immediately once sugar is added into egg yolks, egg will cover the sugar and turned hard if sit there for too long). 3.Add in corn oil, mix well. Then add in strawberry puree and milk, stir well to combine. Add in flour, stir to well combine. 6.Now change hand whisk to a silicone spatula, fold in 1/3 of meringue, gently fold with egg yolk batter till slightly combined. Fold in the balance meringue and gently fold till well combined. 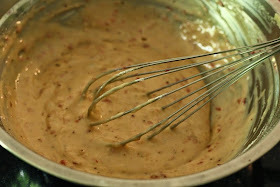 7.Pour cake batter into chiffon pan, wipe off those excess batter stick on the tube or insert area. Fill batter about 80% full but not fill too full as cake has no space to rise while baking and resulted cake shrinkage. Tap pan on the counter top to remove air trapped inside the batter. 8.Bake at pre-heated oven at 170c for 35mins-40mins at middle rack or until cooked. 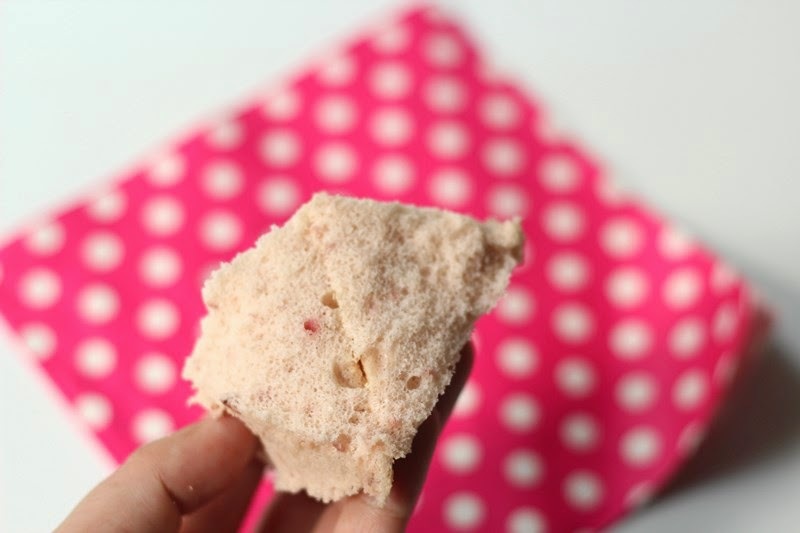 9.Once baked, turn your chiffon tin upside down and cool completely before remove from the tin. 10.Chiffon cake is ready to unmould. You can use a plastic thin spatula to run the pan and unmould the chiffon or you can unmould using bare hands method if you have master this skill. 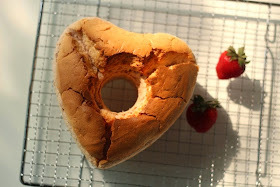 Strawberry andlove shape chiffon ~ they are so match together, isnt it? Snf I know it is sure to be yummy! Nice aroma sweet smell of the fresh strawberry in this cake. Sounds so yummy! Simply love this lovely heart shape strawberry chiffon cake ! I am sure son must be very happy with this all-natural strawberry chiffon. Natural ingredients for cakes is best taste wise. Bookmarked. 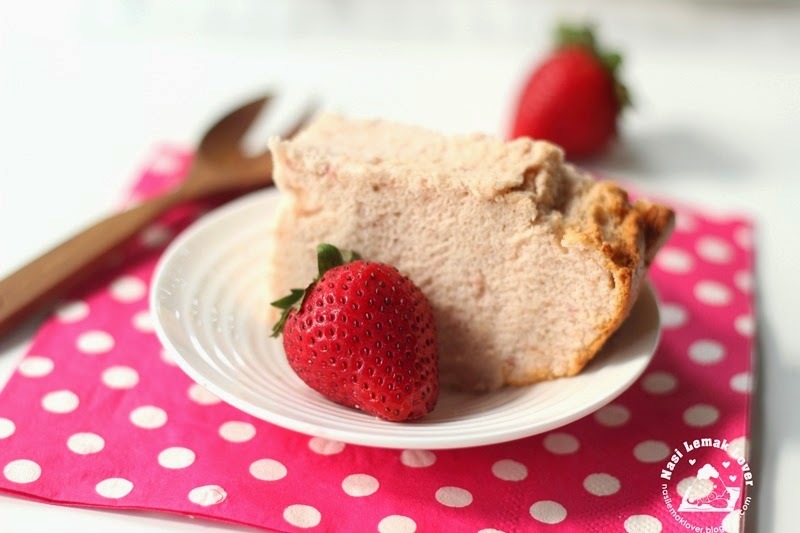 Look how sweet & lovely this strawberry chiffon is! Oh Gosh! 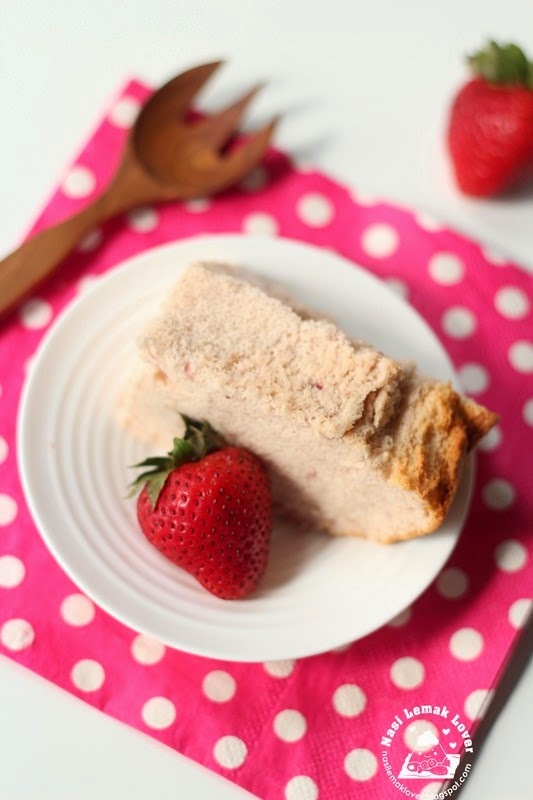 hi sonia, it did crossed my mind to make a strawberry chiffon , i wld love to see a pink chiffon and moreover i think strawberry is a lovely flavour too. Happy to see you lining your chiffon post with us, thanks! 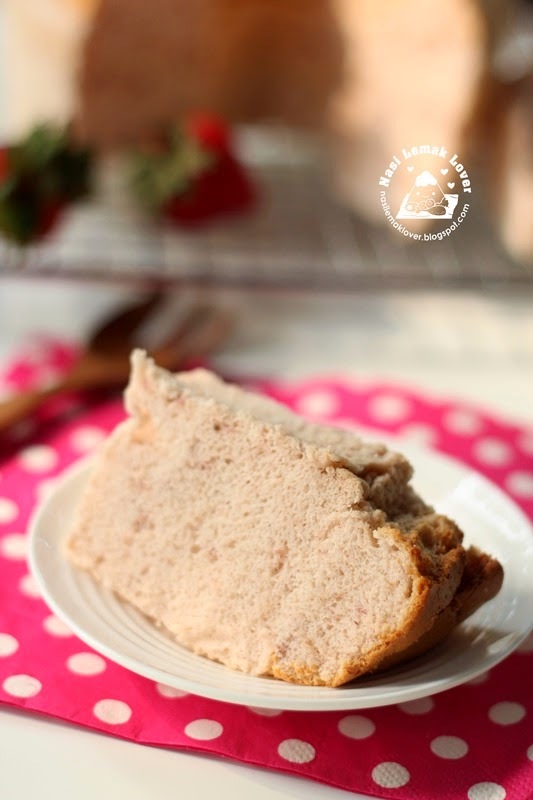 Lovely chiffon cake, and using fresh strawberries sounds very yummy! Thanks for sharing your lovely cake with Bake-Along! You're an awesome baker..the str awberry chiffon cake looks too delish..
One of my favorite fruit as well :D Yeah , I haven't bought a chiffon pan yet *sigh* Gorgeous cake , Sonia ! Hello, thanks for sharing this recipe. I wanted to know approximately how much strawberry makes 55g puree? Thanks Sonia for the wonderful cake recipe .This time I used kadota fig ( from my garden) instead of strawberry and it turned out very good. I wanna try this recipe but only have strawberry yogurt drink in fridge. Can i replace strawberry puree and milk with 65g of strawberry yogurt drink? Hi Sonia, is it possible to use self raising flour as having too much self raising flour. Thanks. 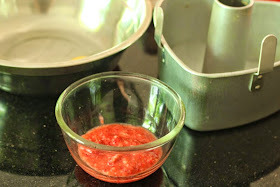 Hi Sonia,anything can replace strawberry puree? Can use strawberry yogurt drink to replace? Michelle , you will get slightly firm texture of using self raising flour.